Back in 2010 the Resource Lounge was just an idea, it then became a gathering for collaboration. The NEW & IMPROVED Resource Lounge is topic oriented with you and your mission, business and passion in mind! Storytelling is one of the world’s most powerful tools for achieving astonishing results. You are invited to participate in the Resource Lounge on this topic because your story matters! 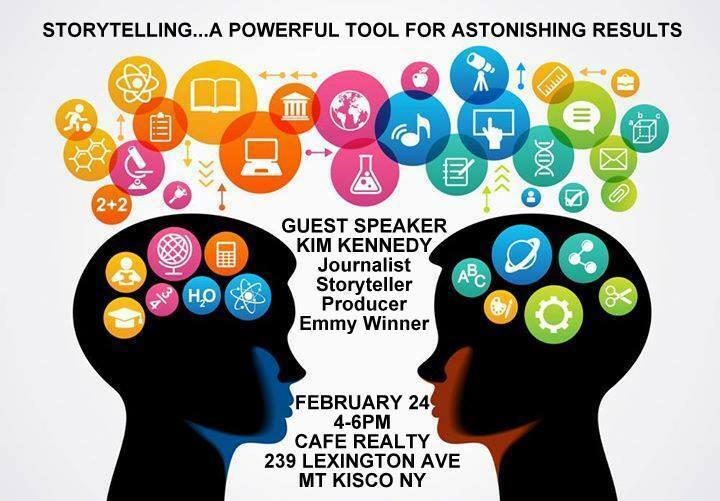 Elisa Bruno-Midili welcomes special guest and long time friend, Kim Kennedy, of KimComm – video production and media consulting, 3x emmy winner and 30 year veteran of news and business reporting for CBS, CNN, CNBC. (Evening News, Sunday Morning, 60 Minutes, the Early Show). Storytelling in brand marketing is showing great results! Make your brand compelling, memorable and sharable with storytelling.